Having been born and raised in the Boston area makes me a far cry from a Southern lady. But there is one Southern tradition that I can't get enough of and that's monogramming. Maybe a few too many games of Pat-a-cake and marking things with a B really stuck in my head. Have you seen the new Design Darling boutique? If not you must go visit, it's super cute! 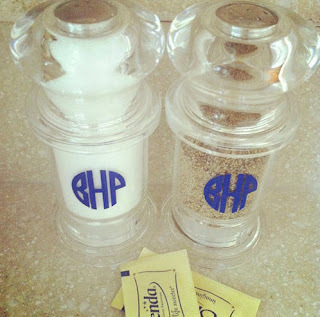 I just love these monogrammed salt and pepper shakers. I mean pull these babies out during a back yard BBQ and you most certainly will be the hostess with the mostess. Monogram Inc. has some of the most amazing and sophisticated monogram styles I've seen. 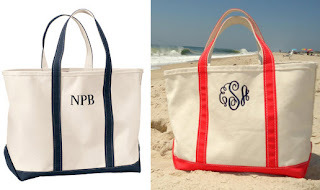 They customize your very own monogram style with 1-3 initials and I'm just smitten. Its not cheap, but if you are getting married soon having your very own monogram would be perfection. Patricia from PVE is one of the sweetest, nicest bloggers out there and she also happens to be super talented. 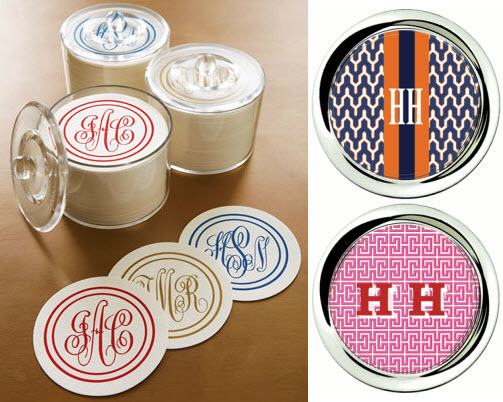 I just LOVE her personalized monograms and I think they make the perfect personalized stationery. I just recently got the silver tag on my keychain monogrammed and I love how it came out. These other keychains are super cute! Pink acrylic keychain, gold enamel keychain, or make your own needlepoint key fob with this kit. 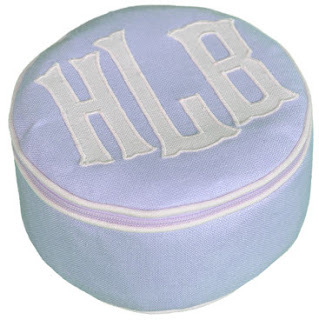 No monogram list is complete without a mention of Leontine Linens. 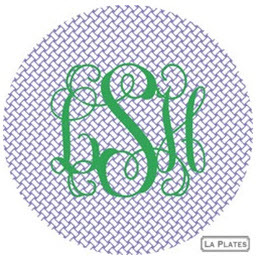 I wish I could just call them up and order one of everything- I mean their monograms are ahhh-mazing. While I save up my hard earned pennies or until I have a first born to offer up, I'm loving this more affordable jewelry round. These coasters would make the perfect coffee table or bar tray accessory. Both would make a lovely hostess gift as well. They are from Horchow and Iomoi. Graphic Image has really great leather calenders and journals and of course they would not be complete without your monogram. I have a blue croc refillable journal and I love it! I think I put the LLBean Boat and Tote on every list I make, but I really love it that much. That being said, its not complete without a personalized name or monogram on it. The photo on the right is from EAS's blog, she had hers custom monogrammed at a local place and I just LOVE hers. 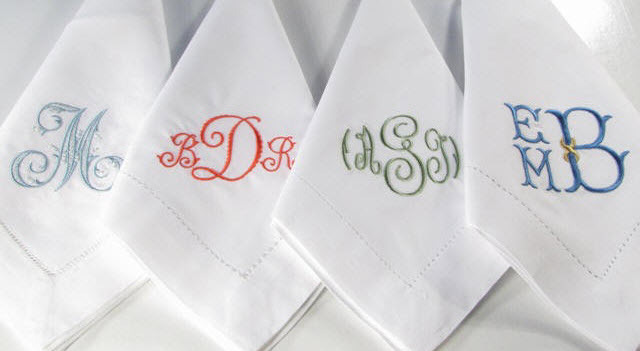 A lovely wedding or hostess gift would be a set of linen monogrammed napkins. In fact my very good friend Stephanie gave me a set for my wedding- of course the monogram is in orange and I love them! My Grandma loves a good game of Bridge and in fact plays 2-3 times a week with her friends. I gave her a set of these Tiffany playing cards for Christmas a few years ago and they were a big hit. I cant imagine a more chic ladies poker night with these personalized blue and green playing cards. 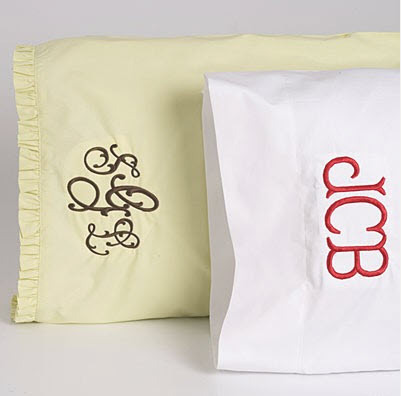 I love me some fancy monogrammed bedding! There are about a million places out there that do monogrammed pillowcases and bedding- my favorite fairly inexpensive sources are Etsy, Land's End & Garnet Hill. 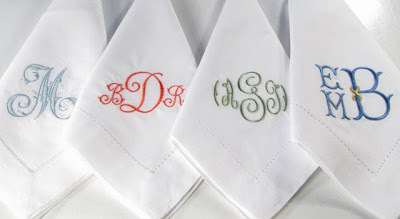 Last but certainly not least are one of my favs and thats a good monogrammed hand towel or tea towel. 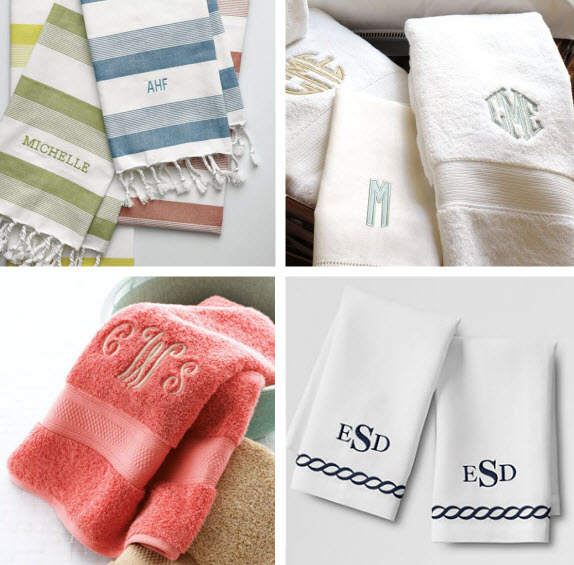 Just like bedding, monogrammed hand towels are super easy to find. I think that personal touch make any old kitchen or bathroom extra special. The ones above are from: West Elm, Pottery Barn, Horchow, and Lands End. I had to control myself and stop, otherwise this post would never get published. I could go on and on with all the things that I love monogrammed, the options really are endless. 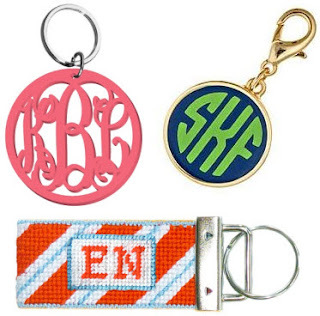 So tell me, what monogrammed things do you love? 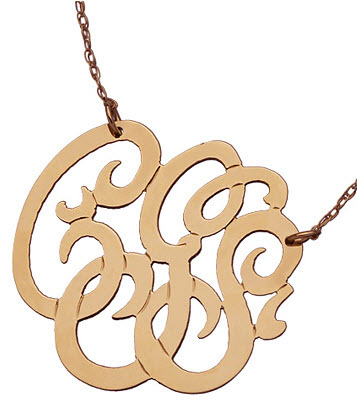 I LOVE that monogrammed necklace you posted! I usually see it on linens and bags but this is a great way to wear a monogram! I'm a fan of the Reese Witherspoon approach: If it's not moving, monogram it. Love La Plates! I got my sister a monogrammed shopping bag from them for grocery runs and she uses it all the time. Great collection of cute thing you have here! I LOVE the monogrammed tiffany's playing cards -- I might have to add those to my registry! Adore monograms and on my Pinterest page have highlighted a lot. Linens are probably my favorite! Being bron in the south I almost don't even notice monograms. They are seriously everywhere but they definitely make labeling your kid's stuff a breeze. I use the boat tote as a diaper bag and love it! note to self, more monograms and more mammograms too. :) thanks for the shout out to lil ole pve! I can never turn down a great monogram. Thanks for all of the great sites! I just got my Dabney Lee iphone case. It's awesome! I have gotten so many compliments on it! Definitely recommend. AWESOME list! It is all about monogramming. I have been eyeing the Design Darling salt and pepper shakers for a while. I really want to invest in a set of the LA Plates for my daughter as she gets older. they are sooo cute. great collection of monogrammed goodies-- thanks for feeding my addiction!! My friends laugh about my love for monograms.. and I live in the south! I just got my dog's collar monogrammed... ha! Beautiful napkins..amazing for any purposes. This one really incited my senses. I love these ideas. I just monogrammed some outdoor cocktail tables. 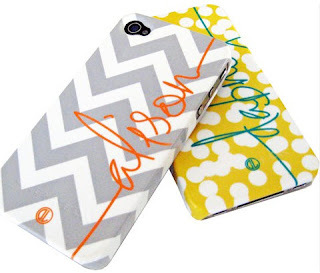 I am a fool for anything monogrammed ... and now I have to check out PVE because the KMM are my initials!! These are so cute!Love the necklace!It's gorgeous!